This is an exceptionally well-designed piece! Compact overall. Graduated drawers. Figured paterae. Delicately turned legs. It is also a piece made for the very wealthy in its day. The household that owned this desk had at least one main servant or factotum or head butler. This desk would be used to contain the documents, receipts, bills, orders, and such for the daily affairs of the household. Some have argued that the drawers flanking the desk were as bottle drawers, but others state they are more likely file drawers. The secondary woods and the thick wood used in construction all declare this as an American piece, likely New England and certainly Northern. Having thin and turned legs announce it is early Sheraton, probably about 1810. 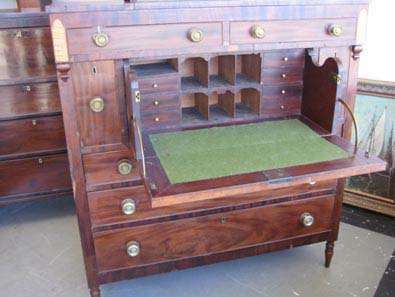 Below are some examples of very similar Butler Chests/Desks.